It is amazing to think that as long ago as the 17th Century Dr. Thomas Sydenham, (English physician, 1624-1689) wrote that; “a man is as old as his artery.” It has taken the best part of 300 years to prove that he was correct and yet even today arterial health is not as heavily ‘relied upon’ as other cardiovascular markers- for example cholesterol. At consultations do doctors identify the real biological age of their patients? No. Perhaps that’s because arterial blood vessel stiffness measurement has been difficult and expensive to undertake? But as you will discover in this page, that all has changed and for the first time arterial blood vessel stiffness measurement has become very affordable and it can even be measured at home. Between risk factors and cardiovascular events we have to look for easily recognizable biological markers. Target organ damage represents this intermediate step. Well-known examples of target organ damage are left ventricular hypertrophy and albumin excretion. 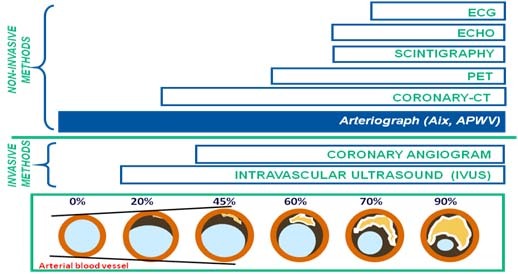 In the recent years it has been found that arterial blood vessel stiffness and increased pulse wave velocity (PWV), as well as central aortic pulse pressure, is important and independent predictors of cardiovascular events. Thus, if you keep ‘thin’ (low viscosity) blood and ‘soft’ arteries (blood vessels) then your chances of a heart attack (or a stroke) are minimal. It makes sense on two important levels, thin blood and soft arteries mean that the heart doesn’t have to work as hard to pump around the blood and flexible arteries and thin blood are less likely to coagulate thus clots are less likely to form. Vascular aging can be investigated directly, non-invasively through the measurement of arterial blood vessel stiffness, central blood pressure and endothelial dysfunction.